“You can learn if you put in the effort,” said Ruth, adding that NASA is a team. SACRAMENTO REGION, CA (MPG) – A standing-room only crowd of adults, college students, teens, and children gathered Saturday, September 29, at the Aerospace Museum of California, a Smithsonian affiliate, to hear Liz Ruth and Ace Beall talk about what they say is the coolest job in the air – piloting SOFIA, the largest flying observatory in the world. SOFIA (Stratospheric Observatory for Infrared Astronomy) is a modified Boeing 747SP that once belonged to Pan Am World Airlines, was sold to United Airlines in 1986, then sold to NASA in 1997. The plane is stationed at NASA Armstrong Flight Research Center in Palmdale, California, not far from where Ruth grew up. She is currently the only female pilot to fly the SOFIA as an active observatory. After a career that included serving in the Air Force piloting the T-38 jet trainer and T-43 flying classroom; as flight officer for United on B737-300, B757, B767, and B777 aircraft; raising a family; and serving as a legislative assistant, she returned to the pilot’s seat in 2016 when she joined NASA. She earned her Master of Aeronautical Science degree from Embrey-Riddle Aeronautical University’s McClellan campus and was stationed at Mather Air Force Base. SOFIA flies just over 500 mph with a range of nearly 7500 miles. Flight and mission crews are joined by scientists, observers, or educators. Although up to 30 people can be accommodated, that is rare they said. SOFIA’s lineage dates to 1968 when a Learjet was fit with a one foot diameter telescope, replaced in 1975 by a modified Lockheed C-141A Starlifter with a 2 ½ foot diameter telescope. SOFIA was put into operation in 2010, boasts an 8 ½ foot diameter telescope, and flew its first mission in 2011. Beall, who didn’t let a technology glitch that interrupted the slide show keep him from discussing SOFIA’s telescope specifications, flew as a space shuttle carrier pilot during much of his thirty five year NASA career. 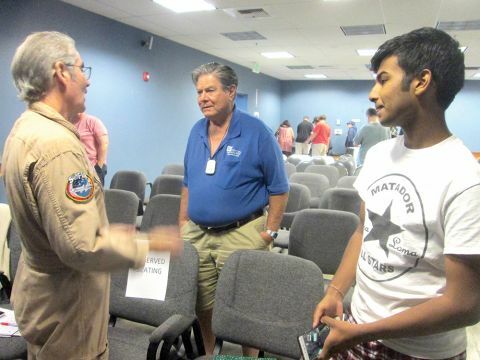 His first ferry flight was in 1984, and the former Air Force T-38 instructor found himself, through a bit of luck of being in the right place at the time, working for NASA and as a pilot flying the T-38 again. Although he retired from NASA in 2005, he kept flying and flew SOFIA until last year when age restrictions took him out of the pilot’s seat. Although Beall never flew with Ruth, they both discussed various missions which change nightly. A typical mission, Ruth said, might take her up to Canada and back, then to Mexico and back, then to the East Coast and back. SOFIA crisscrosses the air for the duration of the ten or so hours that crew and scientists are in the air. “The flight patterns drove air traffic controllers crazy,” she said, showing a map of North America with what might have passed for a toddler’s scribbles or a Jackson Pollock painting. The plane typically flies above the Earth’s water vapor line because the telescope needs to be in dry conditions and permits scientists to study the hidden aspects of space, to learn about the birth and death of stars, and to figure out how it all works, they said. SOFIA uses over 200,000 gallons of fuel per flight and weighs more than one half ton at takeoff. Ruth and Beall responded to many audience questions who wanted to know how SOFIA could be improved, what the pilots eat during the mission, why they wear those uniforms, whether safety belts were used, and how to get on one of the flights as a teacher. “You have to apply,” Ruth said. “You can learn if you put in the effort,” said Ruth, adding that NASA is a team effort with jobs in many fields – accountants, public affairs, photographers, mechanics, and is not just for astronauts or pilots. Beall suggested finding something you love to do, do a good job, don’t make enemies, and admit when you’ve messed up. For additional information on Aerospace Museum of California, visit: https://aerospaceca.org. For additional information on SOFIA, visit: https://www.nasa.gov/mission_pages/SOFIA/index.html.